Take a listen to today's rock radio, and the truth is evident. Helmet, the seminal NYC noise metal groove clan, and its simple, stark, and crushing riffs have influenced a generation of musicians from Korn to any current aggro rock darling. UNSUNG is the 21-track testament to the always one step ahead of the times Page Hamilton and crew's importance on the hard rock landscape, as no band has even come close to the brutal beauty of songs like "Unsung" and "In The Meantime". While much of the sound which Helmet pioneered changed through the years, it always was jagged and revolutionary. 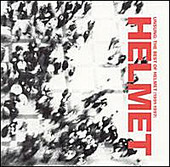 Culminating in four album's worth of material and countless too little, too late praises and adorations, Helmet's six-year career-span spearheaded the movement when the lines between metal and the rest of the music world began to blur. For a quick lesson, or to refresh your memory, this greatest hits package suits both purposes extremely well.